The following article is neither to be considered as medical advice nor making any allegation towards a specific individual or group. With lab screening for steroids in effect, participants of athletic competition have tested clean when later revealed they used variations undetectable by the testing. A proposed supplementary system takes into account measurable factors based on the side effect, growth of bones in the head and face beyond the biologically occurring expected range. Noticeable to visual observers a technical approach may apply for the purpose of league sanctions, where entrants opt-in for qualification. This is not to suggest there is a problem with the way any one’s head may look at a single point in time; we are only worried if there is an otherwise unexplained fluctuation over a given duration. The procedure uses facial-recognition technology to evaluate images from different angles of the subjects’ cranial region. After an initial baseline scan, periodic follow-up inspections are made for comparison. Computer software can assess proportions, contour, surface area, and other variables. The object is to identify changes in size or structure outside a normal expected range. When a violation is detected the individual would face suspension until a later exam confirms the rate of growth has returned to normal, along with to standard league penalties. A more detailed framework is to be established, including to determine an effective limit to the amount of fluctuation that can occur naturally; parameters may vary based on age, body mass ranges, and additional factors. Also there should be some amount of increase expected when one adds bulk fair & square, otherwise would be out of proportion the other way around. Another form of testing to consider is for those who have consumed a substance of concern to monitor themselves for effects after the fact. A female may notice physical features becoming more masculine from intake of testosterone or its variants; conversely the male endocrine system shuts down regular production in response, over time requiring the individual to use greater amounts to maintain original levels after the drugs wear off, leading to an eventual state of gender confusion – such characteristics can also occur in nature from infancy, the concern is active or former steroid users noticing an unexpected shift; also this does not mean the same treatment would be called for in both cases. 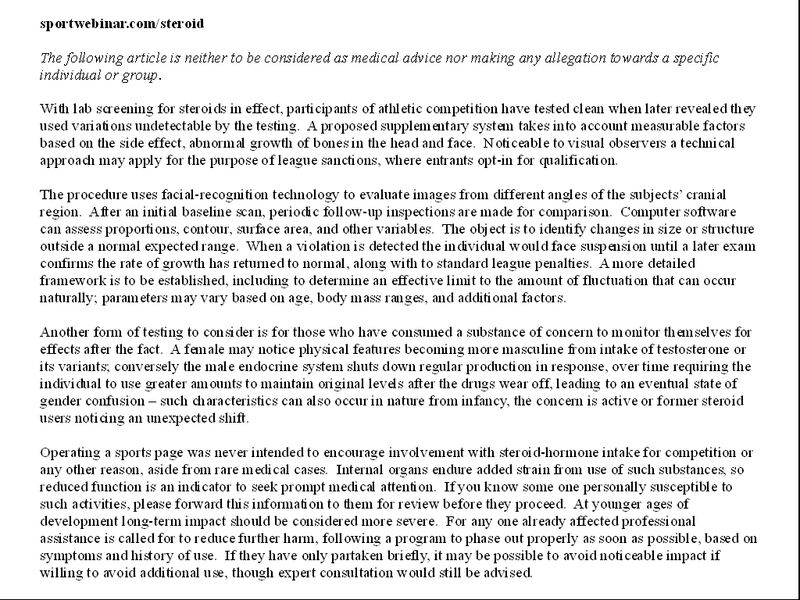 Operating a sports page was never intended to encourage involvement with steroid-hormone intake for competition or any other reason, aside from rare medical cases. Internal organs endure added strain from use of such substances, so reduced function is an indicator to seek prompt medical attention. If you know some one personally susceptible to such activities, please forward this information to them for review before they proceed. At younger ages of development long-term impact should be considered more severe. For any one already affected professional assistance is called for to reduce further harm, following a program to phase out properly as soon as possible, based on symptoms and history of use. If they have only partaken briefly, there is a chance to avoid noticeable impact if willing to not pursue extended use; expert consultation would still be advised to oversee the phasing-out process, as discontinuing usage outright without scaling back at the correct interval can increase the possibility of long-term effects. At the top levels of modern athletics, most of the substance usage takes place for the purpose to recover from injuries, under counsel from scientists to manage the risk-tradeoff. Players are often under pressure to meet expectations of the town they represent, along with organized gambling outfits. Our objective is to improve testing to make detection less avoidable, so they will no longer be forced to make these difficult decisions. Generally they were already capable of reaching the higher leagues, then taking these drugs to try and maintain; we need to make sure those in junior divisions do not expect this will give them extra ability they would not have otherwise. Consuming for recovery also applies in other occupations, ranging from public service to entertainment sectors. Our goal to provide more of the full picture to help make an informed decision, not trying to give regrets to anyone already involved. It needs to be remarked an average person can legally purchase products from vitamin or “nutrition” retail outlets, containing substances already banned by sports authorities. Much of the health supplement industry operates outside of the regulatory environment, where items can be sold over-the-counter that have already been flagged by league protocol as harmful, and customers will not have a professional to oversee the risk management. Also there are certain related medical materials, legally approved and casually issued by licensed providers, which are arguably causing worse damage than the substances commonly used in athletics, birth control and abortion industry that is. This entry was posted in Webinars on May 27, 2016 by . Please contact via the request page or any of our social media outlets if there is anyway you can help. 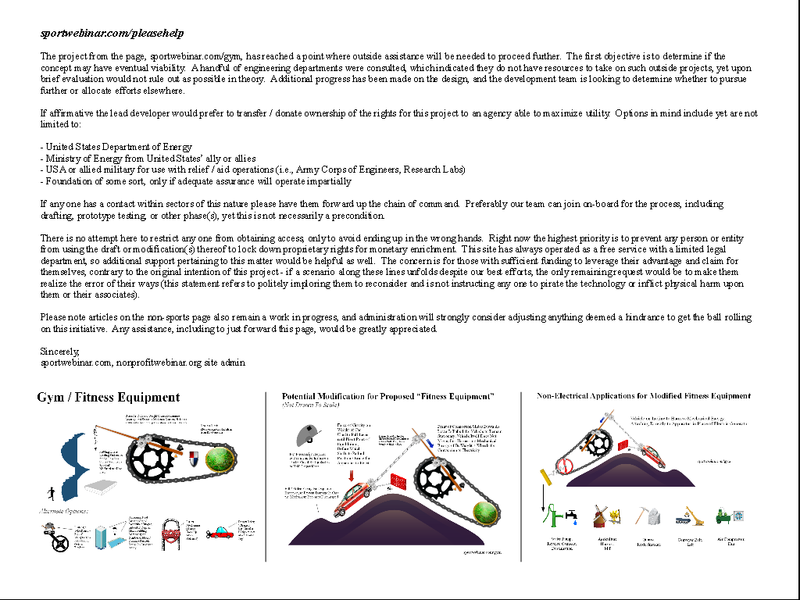 The project from the page, sportwebinar.com/gym, has reached a point where outside assistance will be needed to proceed further. The first objective is to determine if the concept may have eventual viability. A handful of engineering departments were consulted, which indicated they do not have resources to take on such outside projects, yet upon brief evaluation would not rule out as possible in theory. Additional progress has been made on the design, and the development team is looking to determine whether to pursue further or allocate efforts elsewhere. If any one has a contact within sectors of this nature please have them forward up the chain of command. Preferably our team can join on-board for the process, including drafting, prototype testing, or other phase(s), yet this is not necessarily a precondition. There is no attempt here to restrict any one from obtaining access, only to avoid ending up in the wrong hands. Right now the highest priority is to prevent any person or entity from using the draft or modification(s) thereof to lock down proprietary rights for monetary enrichment. This site has always operated as a free service with a limited legal department, so additional support pertaining to this matter would be helpful as well. The concern is for those with sufficient funding to leverage their advantage and claim for themselves, contrary to the original intention of this project – if a scenario along these lines unfolds despite our best efforts, the only remaining request would be to make them realize the error of their ways (this statement refers to politely imploring them to reconsider and is not instructing any one to pirate the technology or inflict physical harm upon them or their associates). Please note articles on the non-sports page also remain a work in progress, and administration will strongly consider adjusting anything deemed a hindrance to get the ball rolling on this initiative. Any assistance, including to just forward this page, would be greatly appreciated. This entry was posted in Uncategorized on April 29, 2016 by . Joining a fitness center is a luxury many cannot afford. Our preference is to set up a gym where membership pays for itself, and patrons can receive cash back for participation. Currently customers exercise and expend energy, which mostly ends up going to waste, whereas instead their activities could be harnessed towards the production of electricity. Energy companies offer payouts for households which contribute power back to the “grid,” such as from wind generators on one’s property; this principal is to be further evaluated for applications with fitness instruments. In terms of payments gym members could carry an ID to scan before using certain equipment, so energy production gets credited towards their account, applied to the cost of membership, with direct monetary compensation for anything extra. Facility ownership skims off a percentage to cover expenses / investment, and the supplemented electricity helps power the facilities. Force is required to operate electric generators, which basically involves rotating a wheel. Typical power plants are designed to boil water, steam from which spins a fan connected to the generator in question; for our purpose mechanical / physical energy turns the generator directly. The objective is improving current technology to enhance leverage for the amount of work from each exercise, using the principles of “simple machines,” i.e., wedge, pulley, inclined plane, lever / fulcrum. 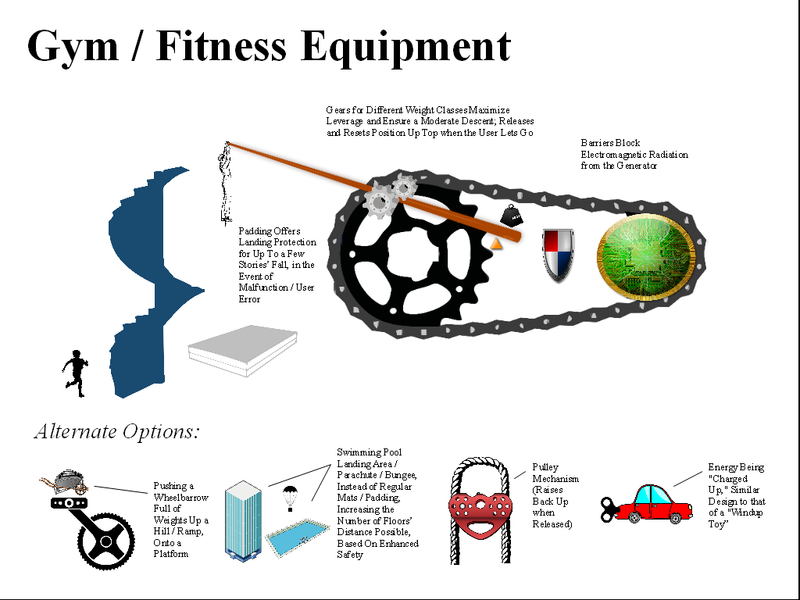 The optimum apparatus or combination thereof will vary, based on the nature of different exercise equipment; weightlifting machines would be utilized differently from stationary bikes, stair-climbers, elliptical, and so forth. 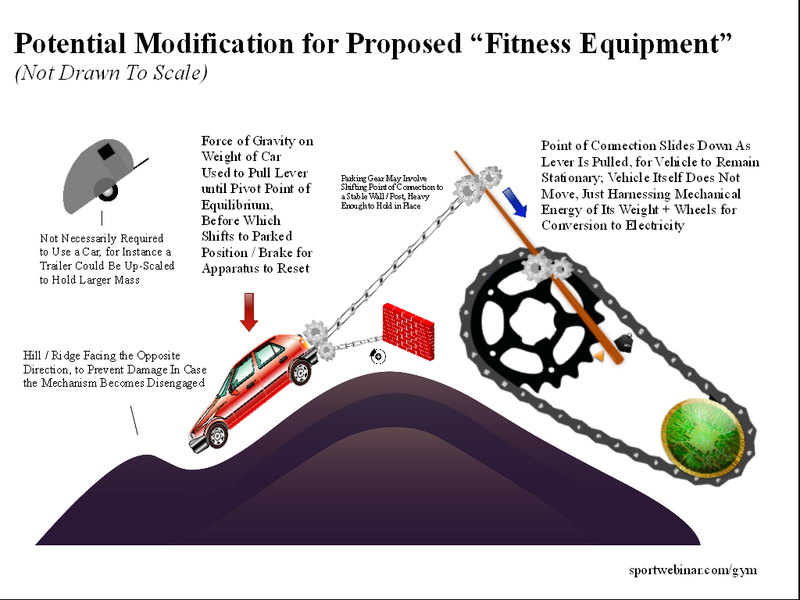 As a more practical approach alternative options need to be developed and made readily available, for instance the notion of a human-sized “hamster wheel” and other mechanisms where users put their full bodyweight into the process, such as repeatedly climbing up a flight of stairs and driving all their weight into pulling a “lever” on the way down, employing the force of gravity. 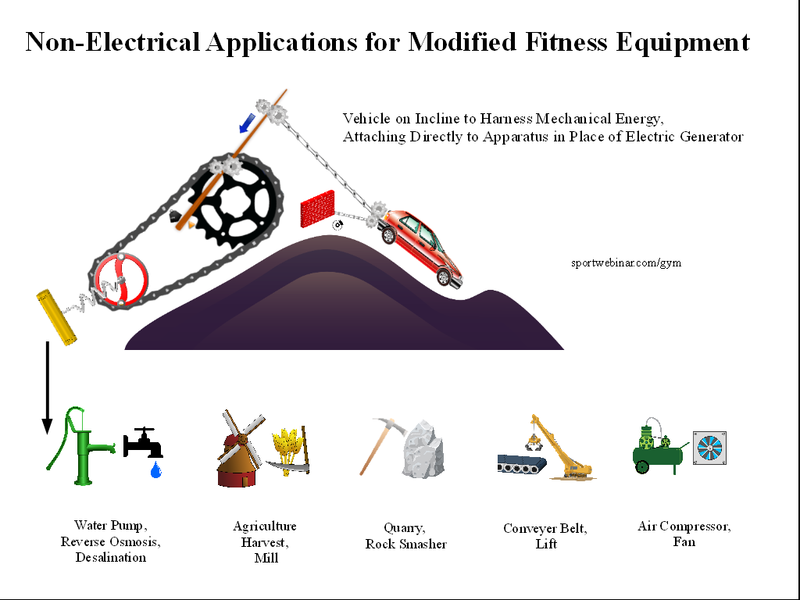 Further assistance is requested from engineers / scientists in developing methods to “amplify” energy transferred from an individual’s exertion on such apparatuses to the generator itself. Instead of “spinning the wheel” directly, some options may combine efforts across multiple machines, perhaps shifting quantities of water for hydroelectric energy or air compression operating a turbine. Any contributors to design and test a range of such applications, preferably open source, would be much appreciated. Equipment in question shall be also made available for home use, for household incentive payments and to have on hand as an emergency backup. Eventually such technology can hopefully provide a basic electricity source for less developed world regions. Before any further progress is made, it needs to be noted electricity generators give off electromagnetic radiation, which is considered harmful to the health of any one in range. Before installation every one must ensure users will be shielded from all such hazards, including sufficient barriers / grounding, confirmed by testing via Gauss Meter. If possible the distance between individuals and the generator should be far enough away from hazard range, so the person’s work takes place where electric fields are out of the picture. 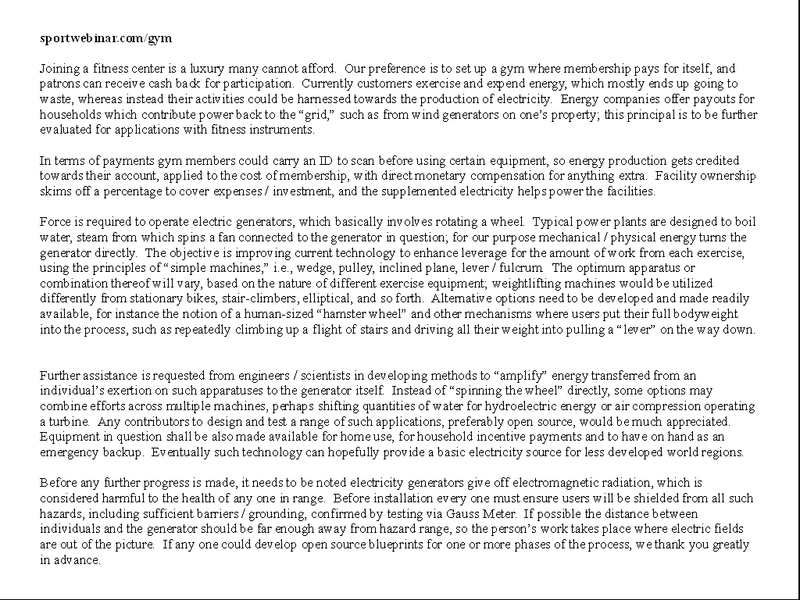 If any one could develop open source blueprints for one or more phases of the process, we thank you greatly in advance. 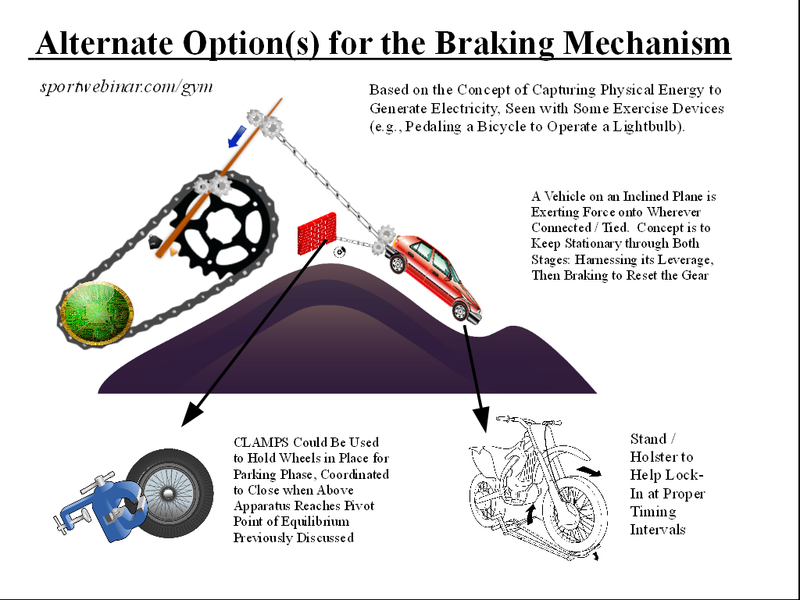 – Physics Stack Exchange – How Do Levers Amplify Forces? – How Do Power Plants Work? – Department of Energy – How Do Wind Turbines Work? – What Are the Health Risks of Living Near an Electric Substation? – What is a Gauss Meter? – Best Hand Crank / Solar Lantern Available? This entry was posted in Webinars on December 31, 2014 by .